If one is going to camp, one must eat well. In our case, we eat extremely well. I whipped up so many lovely things for our trip this weekend I couldn't pick a photo to go along with it. 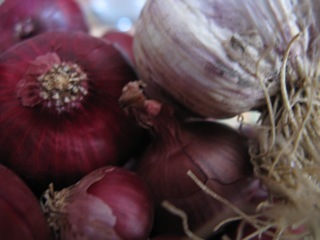 I chose the adorable baby onions and Red Russian garlic from the Dedham Farmers' Market instead. The reason? 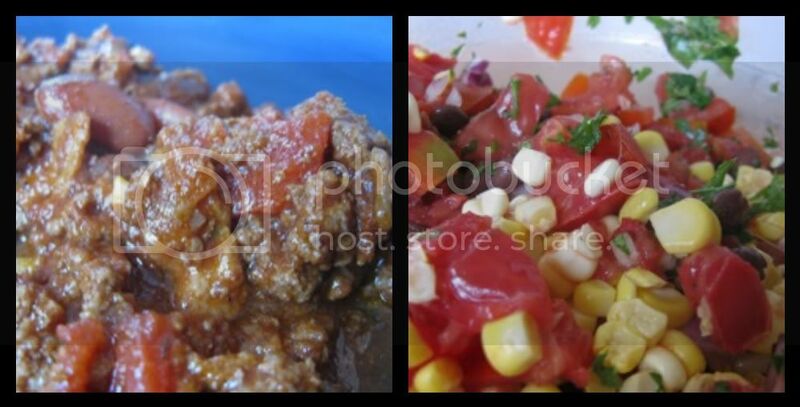 It's simple, it's beautiful, and it's made my fresh salsa go from simple to simply amazing. If you haven't gotten a chance to stop by Dedham's market, it's a fabulous find. It's open on Wednesdays from 12-6 through October and has some fabulous finds. The baby onions and smokey Red Russian garlic are an unbelievable and delightful find. Forgive me for forgetting the name of the farm, maybe Johanna can remind me. She's the lovely woman who runs to Dedham Farmers' Market. I digress, however. I love to camp. I love sitting out under the stars, listening to the ball game on the radio, relaxing with the husband. The highlights of our camping experience always are the meals. On tap this weekend? A lot of bacon-related items. It's the husband's birthday, and the boy loves his bacon. Here's the menu: Bourbon steak tips and Monterrey jack burgers from Tendercrop Farms, three types of sausages from Fowles Market, and a Bacon, Bean and Beef chili (it's from Cooks Illustrated, if you're curious). They'll be paired with Corn, Cheddar, Chive and Bacon Potato Salad (recipe to follow), fresh salsa (thanks Tracey of Blue Egg Baking Co. for the idea) and plenty of yummy regional beer to wash it all down. That doesn't include the home fries, the bacon, the frittatas we'll make over our trusty little grill. Oh, and I made s'mores bars because we're camping at music festival and we can't have the open flames, but I still want s'mores! Enough of my chit chatter, right? 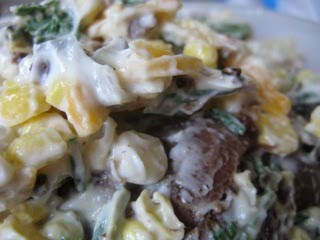 The highlight of my weekend is going to be the Corn, Cheddar, Chive and Bacon Potato Salad. Would you like to try? Scrub and put the potatoes in a large pot, cover with cold water. Boil and cook until potatoes are fork-tender, but not mushy. Drain out water, put aside, and allow to cool. Fry up strips of bacon until crispy enough to crumble. Transfer to a paper-towel lined plate to cool, then crumble with your fingers. While those potatoes and bacon are cooling, chop up your chives and parsley. Cut potatoes into bite-sized pieces once cooled and put into a large bowl. Add crumbled bacon, parsley and chives, and shredded cheddar. Season with salt and pepper. Finally, add mayo and mustard and combine until everything is coated. You and your husband really know how to party! Love all the bacon involved, I can almost smell it from here!